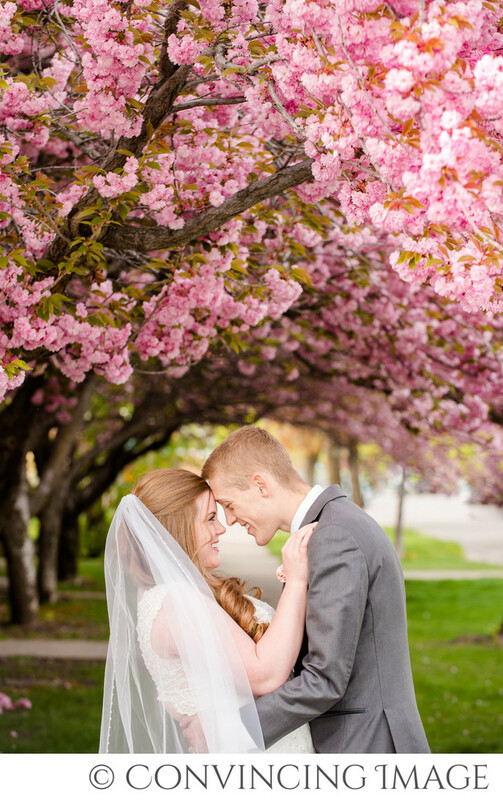 Logan, Utah is such a stunning place to photograph throughout the year. It's a small city, but so full of character. Not long before this shoot, I was driving around enjoying the beauties of spring, including leaves beginning to form and grass going from brown to green. *Sigh* I love it! On this particular day, I happened to be looking for a beautiful tree that was in a public place that I could photograph. If we want to go to a place that isn't public, we always, ALWAYS ask permission. (Pet peeve alert: don't go on property that says "No Trespassing" without permission. It shocks me that people actually do that. Let's be respectful of others' property.) Anyway, luckily for me, as I was driving, I found this beautiful tree hanging over the sidewalk. Yay for public sidewalks! Later that day, we had all but finished our shoot and I begged the couple to trust me and drive a few blocks from where we'd been shooting. Thanks, sweet couple for trusting me! We got to the spot and they quickly found out why I brought them there. Oh the pinks! The natural arch! Pretty much the most beautiful tree in the valley. My point is, trust your photographer! They know what will look good through the lens and if they are anything like me, they're always looking at the world trying to find their next pictures spot.